(Apply Daily) Pink is from Hong Kong. She has not had a full-time job for ten years, but instead has been travelling to and from a tiny land in the Himalayas – Nepal. After surviving the disastrous 2015 Nepali earthquake (which had a magnitude of 7.8), Pink felt that “It was really good to be alive”. She then established a non-profit organization to support earthquake victims. Today, she spends more than half of her time travelling in various places in Nepal every year. Although after getting out of the jeep, volunteers on the “Light On Your Path Journey” walk for one hour with their luggage to the site of the rebuilding project, many Hong Kong people are still willing to come and experience. Pink compared the situation with an “extremely strong wave” on a ship. After the earthquake, she slept overnight in an outdoor car park in Kathmandu and reunited with her Nepalese friends the next day. Pink and ten-something Nepalese friends shared a tent for a few days, and experiencing the multiple aftershocks with different magnitudes throughout the month. 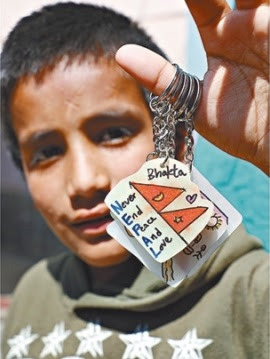 The Nepalese people like to introduce their country as “Never End Peace And Love (NEPAL)”. 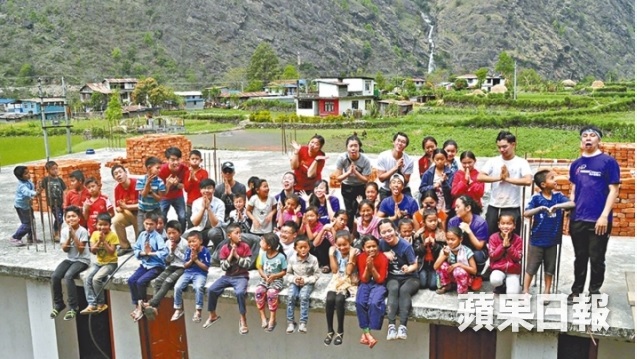 After visiting various sites affected by the earthquakes, she chose the sites for rebuilding schools, and recruited Hong Kong people to participate in the school rebuilding projects. ‘The name of the project “Light On Your Path Journey” implies my hope for the participants getting enlightened.’ Pink said. Volunteers from Hong Kong have to fly six hours, and drive an entire day to the project site. (The cost is actually higher than using donkeys to transport building materials.) 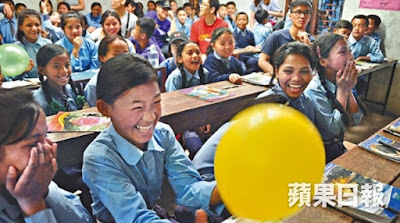 ‘I organized these projects because I hope the volunteers can show solidarity to the Nepalese.’ She hopes that Hong Kong people (who are relatively lucky), do not perceive this trip as “helping others”, but rather cooperating with the local people. The stem “vol” of the word “volunteer” originates from the Latin word “volition”, meaning “will”. She thinks the term used in mainland China and Taiwan zhigong (志工 “will-worker”) is more appropriate, because it implies that it’s the volunteer’s own will to do this, while the Cantonese term yigong (義工, “responsibility-worker”) implies action out of mercy, which “sanctifies” the action and implies hierarchy. Apart from participating in rebuilding projects, volunteers also teach and lead activities at the local school. I have a simple wish, to feel and understand the world with my heart.